One Tower Bridge is a mixed-use development by Berkeley Homes spread across nine blocks. It includes residential and retail space as well as a variety of new restaurants and a state-of-the-art theatre. The scope of the external works landscaping package included the detailed design, procurement and installation of more than 8,000sq m of high-specification landscaping. Maylim’s remit included detailed paving designs, water features, granite cladding and a large range of soft planting with mature trees, specimens, hedging and shrubs. The work was split across four main sections — a ground-floor podium slab; a first-floor communal residents’ garden; the remodelling of Potters Fields Park adjacent to the mayor’s office and Tower Bridge; and S278 works to Tower Bridge Road and Tooley Street. 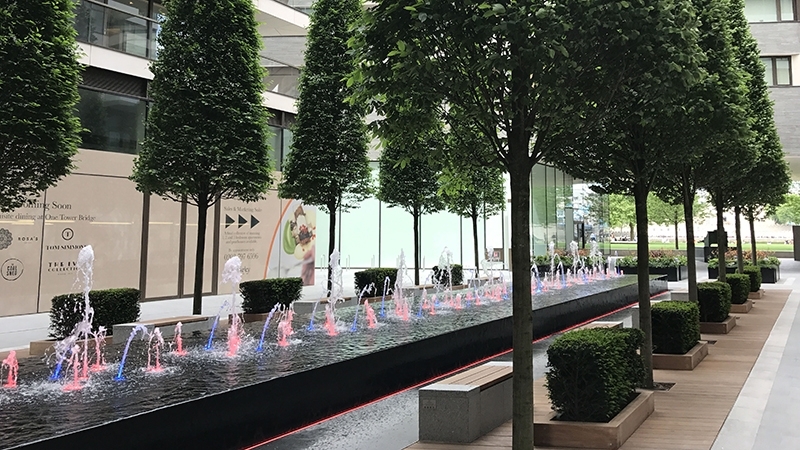 Works were executed in 14 phases across a 30-month period and culminated in the construction of the focal point of the scheme, a large granite-clad water clock feature framed with bespoke timber seating and 12 Carpinus betulus mature specimen trees.